The author wants to show his readers that, while his military career was life-changing, his life beyond the service is also worth telling. Air Force Veteran Clarence E. “Kip” Vold takes a thoughtful trip down memory lane as he shares his experiences growing up as a farm boy and his life-changing journey during his service in the military. Through his heartfelt narration, readers will discover the important points of the author’s life while he honors his family’s history. In the “Farmer’s Son, Military Career,” the author talks about his Norwegian roots, how his family settled in the plains of South Dakota, and how his parents met and fell in love. He also shares his memories like completing grade school in a one-room school, surviving blizzards which led them to get lost in their own backyard, and many more memories during his childhood years. After looking back on those early years, Vold opens about his unforgettable service in the military. He gives readers a glimpse of his military career from fulfilling different roles through the years—electronics technician, combat crew member, scheduler for aircrews, military training instructor, and so much more. He also narrates how he achieved the highest enlisted grade in the Air Force. Through his inspiring memoir, the author wants to show his readers that, while his military career was life-changing, his life beyond the service is also worth telling. Not only that, his story will remind readers that it takes positivity and perseverance in order to weather life’s ups and downs. These things further prove that this book is truly worth reading. Moreover, Vold’s inspiring journey will surely relate to every individual who has served in the military. 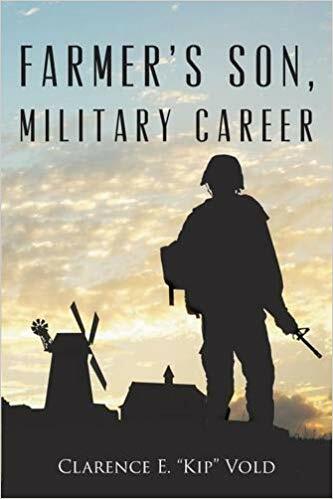 Interested readers can purchase their own copy on Amazon (https://www.amazon.com/Farmers-Military-Career-Clarence-Vold/dp/1634178610/) and other major booksellers online. Clarence Vold was born in Mitchell, SD on February 19, 1940. Though raised on a farm, he did not see his future in farming. He went to college and then enlisted in the Air Force. Throughout his career in the Air Force, he served as an electronics technician, military training instructor and instructor supervisor, and a KC & EC-135 boom operator until grounded medically. He scheduled alert and flight training, missile crew alert duty and administrative airlift mission for 5th Air Force, then aircraft operations management. His boom operator experience included 43 combat missions over Thailand and the Gulf of Tonkin. After retirement from active duty in 1989, he returned to college where he enjoyed the writing assignments and worked for the Hertz Corporation for five years.